A line of religious mobile phone products has been launched by a Monmouthshire firm - including downloading the Bible for £6. Teimlo launched the service called Ecumen to deliver daily prayers, wallpaper and ring tones. Erik Fok, head of sales and marketing, said he believed young people would appreciate the service. "The market for Christian content on mobile phones hasn't been well-served," he said. "There are young Christians out there who want this kind of thing for their phones. "Christian organisations and churches have been on the back foot in terms of communication, and in terms of getting hold of the current technology and ways of communicating. "This provides a tremendous opportunity for them." 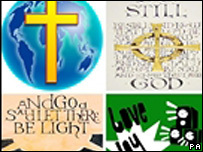 Popular wallpapers available through the Ecumen website include pictures of angels, Noah's Ark, Jesus walking on water and religious messages and symbols. Ring tones range from the traditional Amazing Grace and Bread of Heaven to modern songs by rock group Delirious, to the distinctly unholy sounds of "burps and laughs" and "pig squeal". Non-violent family-friendly games are also available to download and the Bible can be downloaded, marketed with the phrase: "The only Bible you can read in the dark." Pastor Robbie Howells, of Newport City Church, south Wales, said: "Our mission is to get the good news out there through every medium we can. "Mobile phones are such a great way of telling people about the gospel, and as a pastor it gives me a new way of communicating with members of the church, especially young people. It's getting the message across in a fun, funky way." He said he was glad people could now access the Bible easily without carrying the book with them. "Some young Christians may not want to use their Bible in school, but now they can have it on their phone and easily read the scriptures to help get them through the day," he added. "It's one of the things I'm most excited about, encouraging people to use the Bible on a daily basis rather than once a week."